If you’ve seen the 1995 movie “Kids,” you know exactly what it means when I tell you that the same guy wrote and directed “Spring Breakers.” Inappropriate, filthy, suggestive, hypnotizing, hilarious, disconcerting – I felt kind of ridiculous watching it, not knowing if my occasional chuckle was right or wrong. You end with the same sick feeling in your stomach as you do at the end of “Kids.” “Spring Breakers,” however, is not necessarily a warning or a story of redemption, it just ends and you feel kind of at a loss. Writer/director Harmony Korine really likes to make a statement, but the message isn’t totally clear here. Four college friends with idle hands head to St. Petersburg, Florida for SPRING BREAK to let loose and get away from their mundane daily surroundings. We immediately get the feeling that three of the four girls are a little off. Vanessa Hudgens appears to be the most far gone, almost without a conscience. Selena Gomez is the naive friend, leaving behind her prayer circle group in an attempt to reconnect with her childhood pals. There is a lot of awkwardly overlapping dialogue in the first 20 minutes of the movie. At moments, the acting seemed exaggerated and overdone, but it’s obvious that we’re definitely not supposed to like these characters. Realizing they are short on cash for their trip, three of the girls decide to rob a diner. We first see the robbery from the outside, and it's as if they are just running amuck. When we view it the second time, we go inside with them. The brutal and vulgar things they shout at people would scare anyone to death. The ease with which the girls do this is remarkable. Finally they make it to paradise, though it is short-lived. 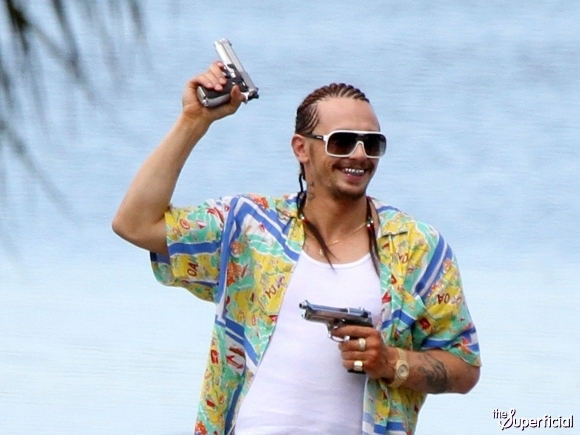 Enter James Franco as gangster rapper Alien, who bails the girls out of jail when their partying goes awry. (Side note – the girls didn’t even have time to find a cover-up before going behind bars, and appeared in the courtroom in bikinis.) Franco is unrecognizable. Repulsive. Comical. It’s really unclear why he comes to their rescue, because his initial intention is not to pimp them out. The relationship he has with these girls is disturbing. Is he a father figure? Is it sexual? This is such a departure from Franco’s usual characters, and he’s awesome in this role. He is the comedic relief without trying to be, though his Southern accent could use some work. I’ll be happy to tutor him; he’s in Asheville all the time, isn’t he? Robberies are juxtaposed with Britney Spears songs, Gucci Mane stars as Franco’s rival, and the idea of dreams vs. reality vs. nightmare, is played with a lot here. Skrillex is also played a lot, which I very much enjoyed. Every party song that you want to hear is sampled, and you’re both disgusted with and envious of the freedom these 18 and 19-year-olds have. Perhaps people are so shocked by this film because two of the main stars are former Disney Channel princesses (Hudgens and Gomez.) Any time a loveable young actress plays a suggestively sexual role, we’re upset. (See Dakota Fanning, Hounddog, but that’s honestly a different level.) You’re in for a ride with “Spring Breakers.” You’ll want to turn it off halfway through, but you won’t be able to look away.